Alfred Williams Consultancy, LLC (AWC) is a Public Affairs/Community Relations consulting firm dedicated to providing concrete, bottom line benefits to our clients in terms of time, effort and money saved. We help our clients start their projects promptly, run them smoothly and complete them on time and on budget. AWC was founded by company President Al Williams in 1993 and has since developed a sterling track record on a wide variety of real estate development and public infrastructure projects in the San Francisco Bay Area. The AWC philosophy is highlighted by an absolute commitment to the success of each client and by our skill at crafting effective, individualized strategies for each project, whether large or small, according to the precise needs and specific nature of the undertaking. At the heart of AWC's ability to contribute to our clients� success is Al Williams' unmatched expertise in public affairs and community relations . 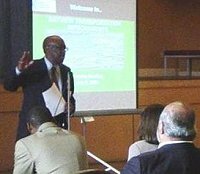 In addition to his thorough knowledge of the San Francisco Bay Area's many communities and his proven abilities as a communicator and negotiator, Al Williams brings a well-earned reputation for integrity, knowledge, effectiveness and efficiency to every interaction and every assignment. Williams started AWC after a 13-year tenure with international commercial developer Olympia and York, during which he became Vice President and General Manager of the company�s San Francisco office.